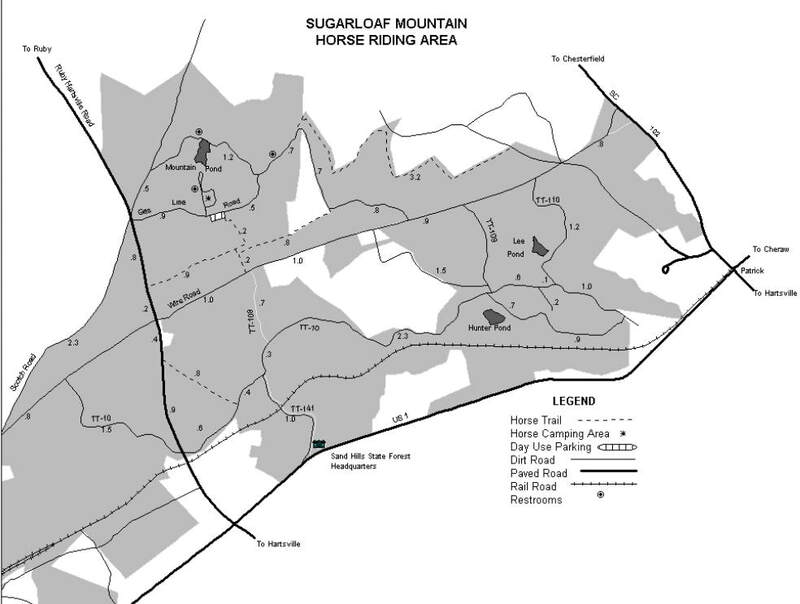 Riding through the rolling sand hills of the Sugarloaf Mountain Riding Area, you watch the process of harvesting, planting and new growth in this managed forest. You ride through rows of planted pine, some young, some mature. An ongoing project in the forest is restoring the redcockaded woodpecker to its previous population and colonies of the woodpecker have been established. You see some Blackjack Oak throughout your ride. This oak gives Pee Dee Barbecue its unique flavor. Turkey, deer, quail and the fox squirrel with a face like a raccoon claim this area as their playground. Indian artifacts have been found here. Paint rocks, hollow inside except for a powdery content, can be found. Most likely it was the Cheraw Indians who mixed the power with water and used it to paint their bodies. Along the Pine Baron’s Trail you pass hardwoods and dogwoods and come across an occasional blackwater stream where you can water your horses. Conveniently at another spot a ford allows you to cross. An old wagon road provides access for horse and buggies and wagons. It is one of the few accessible for these users in South Carolina. As you ride on the mostly red clay you pass patches of beautiful white sand. Thanks to the South Carolina Sporting Dogs and Field Trials Commission the trail is well-marked. From Bishopville: Drive north on SC 341 to Bethune. Turn right onto US 1 and drive to McBee. 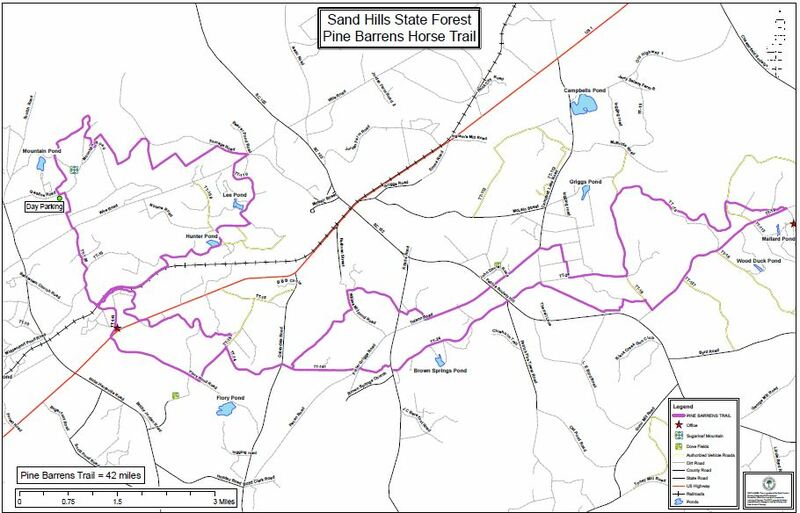 From McBee drive 10 miles and turn left onto Chesterfield County S­13­29. Drive 4.5 miles and turn right onto a sand road. The trailhead is in 1 mile.